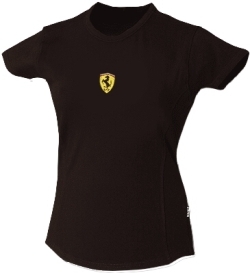 Ferrari Ladies Scudetto Contoured T-Shirt, Black. With this new top from Ferrari your curves will be even more exciting than those of the race track ! Black with small Scuderia Ferrari Shield logo on the front. Material: 95% combed cotton / 5 % lycra.